India has higher infant mortality than Bangladesh and Nepal, both poorer countries. Earlier this month, the Office of the Registrar General of India released data on Infant Mortality Rates for 18 states and five Union Territories for the year 2014. The numbers show that even as most states made some progress in reducing the number of infant deaths, rich states like Delhi and Gujarat continue to have unreasonably high infant mortality rates. Improvement in rural areas was less impressive. Worryingly, rural Rajasthan and Bihar showed slight increases in infant mortality, while rural Madhya Pradesh and Gujarat made no progress. These numbers come after a long two-year drought of mortality indicators in India. Data for 11 states and all-India estimates are still awaited. The Infant Mortality Rate measures the number of infant deaths before age 1 year for every 1,000 live births. Along with life expectancy, the Infant Mortality Rate is the most important health statistic in any country. Improvements in overall and adult health are impossible without declines in infant mortality. These numbers are based on the Sample Registration System surveys. Ideally, all births and deaths should be registered, and infant mortality or life expectancy should be calculated based on civil registers of deaths and births. But in countries such as India, where birth and death registration is incomplete, sample registration surveys are used to estimate fertility and mortality. Figure 1 shows a comparison between the 2014 and 2013 Infant Mortality Rates for states for which the 2014 data has been released. The states have been arranged in the descending order of their 2014 rates. The Infant Mortality Rate has declined in all states except Bihar and Manipur, a positive development on the whole. It is highest in Madhya Pradesh, a state which has had the highest Infant Mortality Rate in India for a long time, and lowest in Sikkim, Nagaland and Manipur. 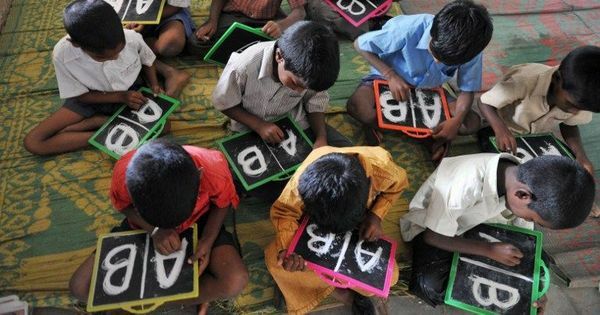 States of the Hindi-heartland, as well as Assam and Odisha, have worse rate than other states. This is along expected lines. 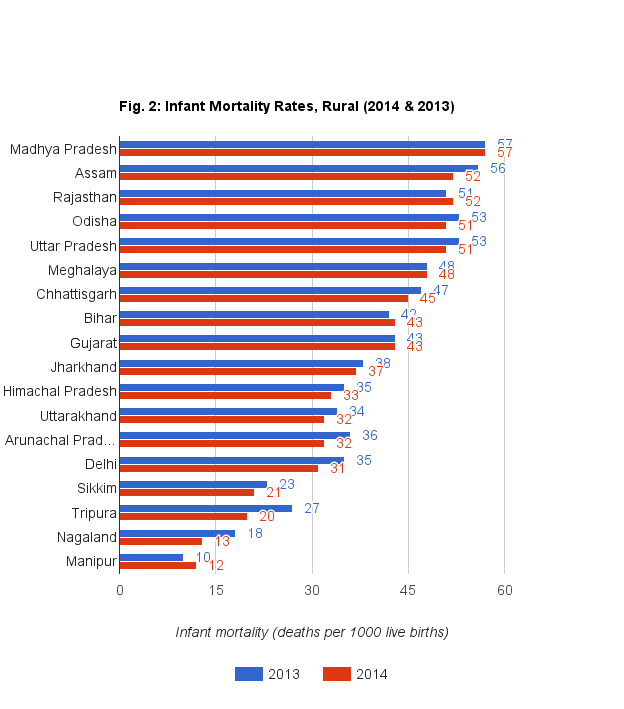 Figure 2 presents the same comparison between Infant Mortality Rate for 2013 and 2014, but only for rural areas. While the overall state patterns are similar, the rural Infant Mortality Rate is generally higher than total Infant Mortality Rate , and progress in reducing rural Infant Mortality Rate is less sharp. Out of the 18 states for which 2014 figures are available, the Infant Mortality Rate in rural areas declined in 12. 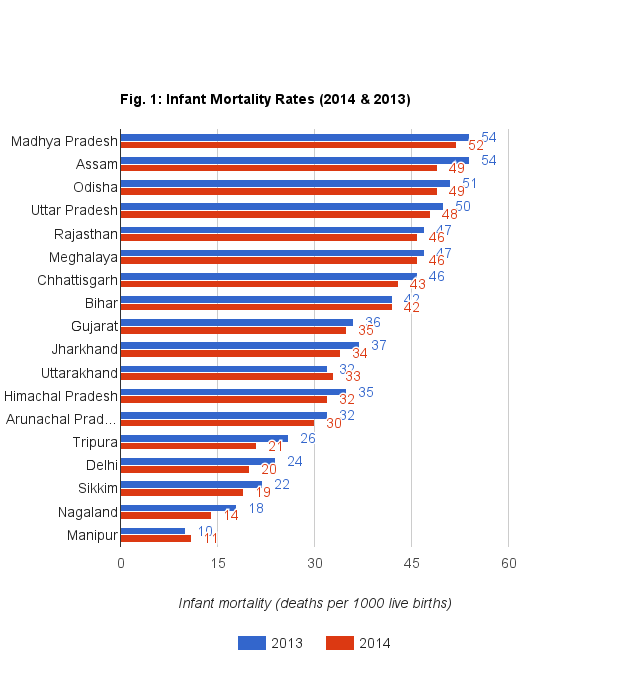 Madhya Pradesh, Meghalaya, and Gujarat made no progress in reducing the rural Infant Mortality Rate while it increased in rural areas of Rajasthan, Bihar, and Manipur. Except Assam, where the rural Infant Mortality Rate showed a decline from 56 to 52, none of the states saw a steep decline in infant mortality. Curiously, rural Jharkhand has lower infant mortality than rural Gujarat, while rural Bihar, which is also very poor, has the same level of infant mortality as rural Gujarat. The lower Infant Mortality Rate in Bihar (and Jharkhand) and high Infant Mortality Rate in Gujarat has been a long puzzle in Indian demography. Figure 3 shows the Infant Mortality Rate for these states’ urban areas. 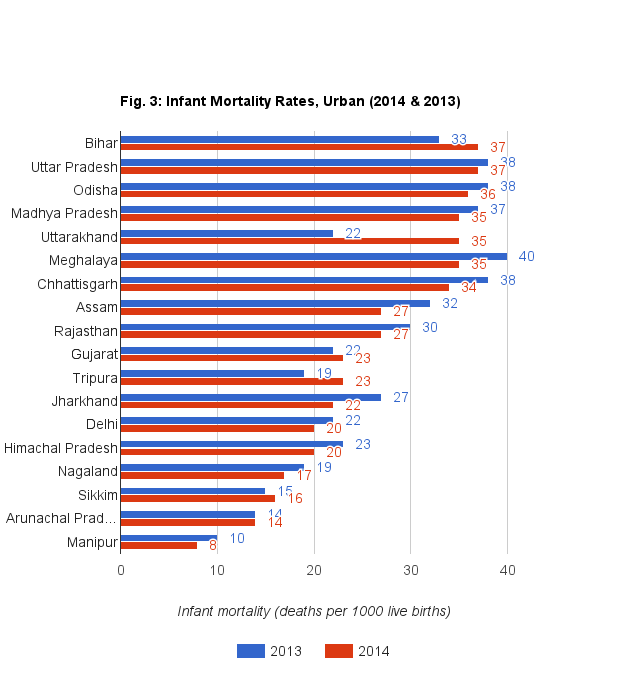 Bihar and Uttar Pradesh have the highest infant mortality in urban areas, followed by Odisha, Madhya Pradesh, Uttarakhand, and Meghalaya, Nagaland, Sikkim, Arunachal Pradesh and Manipur have the lowest urban rates. Urban Delhi, which had 20 infant deaths for every 1,000 live births, lags behind Nagaland, Sikkim, Arunachal Pradesh and Manipur. A very large literature on “early life health” emphasises that the first 1,000 days of life, starting from conception are critical. The brain and body are developing at this stage, and damages due to bad health are often irreversible. 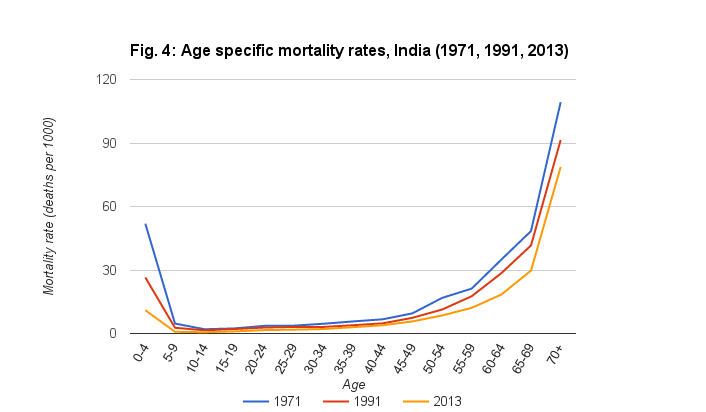 Figure 4 shows age-specific mortality rates for all ages in India, for the years 1971, 1991, and 2013, based on the Sample Registration System. The age-specific mortality rate is calculated by the survey as the number of deaths in a particular age group divided by the mid-year population in that age group. All figures are per 1,000 population. Consequently, in the life expectancy improvements in this period, which was 50 years in the period 1970-'75, 60 years in the period 1991-'95 and 67.5 years in the period 2009-2013, reduction in child mortality had a much larger role than declines in any other age. Jean Dreze and Amartya Sen, in their 2013 book, An Uncertain Glory: India and its Contradictions, analysed more than 5,000 op-eds in the last six months of 2012 in all the leading English language papers. They found that just 1% dealt with health-related matters. Aashish Gupta is a PhD candidate at the Graduate Group in Demography, University of Pennsylvania. Kanika Sharma is pursuing her MPhil at the Centre of Social Medicine and Community Health, Jawaharlal Nehru University.